Lest one think from the previous reviews that the Tysons Corner area is entirely mall-related dining, rest assured, there are a few gems hiding in among the malls and box stores. 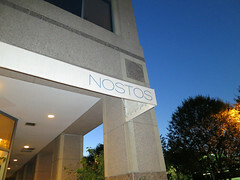 Nestled a few blocks away from Tysons Corner Center in the first floor of an office building is the surprisingly pleasant Nostos, an upscale Greek restaurant. Since I had a free evening, this was also a good opportunity to get together with some of my DC area friends from TCF, so a group of 8 of us descended upon Nostos. One of the things that impressed me right off the bat with Nostos was the excellent service. Despite having our party trickle in piecemeal, they were welcoming and set us up in the bar while we waited for the stragglers. Then, when it turned out that a larger party had a cancellation, they moved us into their large private dining room. And then, the waiter was particularly good at recommending wines and ordering the table a nice selection of appetizers, including some kalarmarkia, some karpouzi (marinated watermelon), garides (shrimp), and a nice place of bread and feta. The kalamarkia was a great start: for every good squid I’ve had, I’ve also had several that were tough and rubbery. 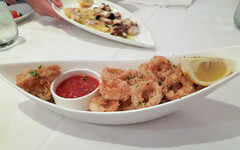 But Nostos has this dish nailed, with tender, nicely breaded rings of squid served up with a pleasing tomato and lobster sauce. 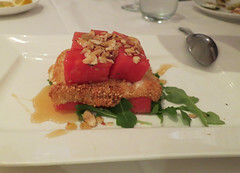 The other notable appetizer was the karpouzi: I’m not usually one for watermelon (to me it tastes mostly like soapy cucumber), but they do a wonderful job marinating it at Nostos, giving it almost a rich wine-like flavor, which paired well with the honey and sesame-crusted cheese it was served up with. This was indeed another winner. And when it comes to Greek food, I’m almost always unable to resist at least one item from the “minced meats” category, like a good gyro. In this case, some bitekakia were in order: a really delicious set of spiced beef meatballs (just teeming with oregano and parsley) served up with a very pleasing tzatziki sauce. These really fit the bill and were well-received by the entire table. When it came to the main course, I ended up with a bit of a dilemma: get the leg of lamb shank (served up with a ine sauce served over orzo), or go for the slightly lighter-looking filet of beef (served up with wine mushroom sauce and potatoes). 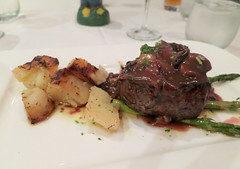 I ended up opting for the latter, and it was a very pleasing dish: a perfectly done filet mignon with a very rich sauce and some perfectly executed potatoes and asparagus. That said, the lamb shank ordered by most of the rest of the table looked absolutely awesome as well, so I know what I’m trying next time. I’ll have to say, as a semi-formal outing with friends, we couldn’t have hoped to do much better than Nostos. The food was excellent, the service fantastic, the wine list rather pleasing, and, after all of that, the bill wasn’t all that bad. I’d certainly consider a return visit the next time I’m up in that area.